From online classes that make it possible to reach students who also hold down full-time jobs to tools that show a community's changing demographics, technology is changing the way people both live their lives and interact with others. 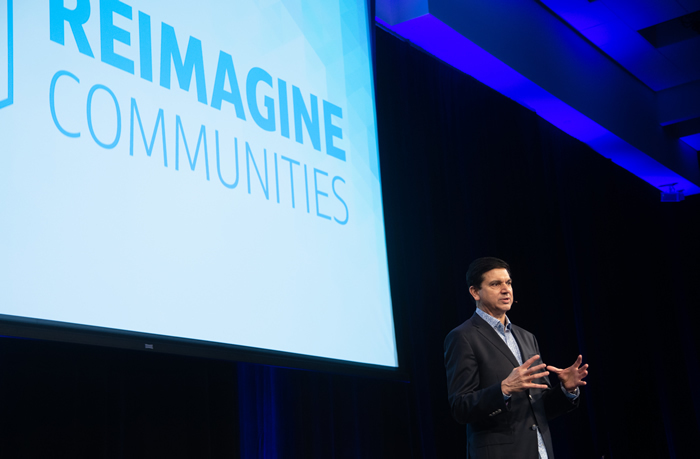 At the recent Reimagine Communities symposium in Dallas, sponsored by Capital One and held with the Urban Institute of Washington, D.C., speakers from across the U.S. shared ideas and stories about how technology can be used to create opportunities for communities and individuals. The event was part of Capital One's Future Edge initiative that promised $150 million over five years to help prepare more Americans with the skills, tools and resources they need to succeed in a rapidly changing, technology-driven economy. Sanjiv Yajnik, Capital One's president of financial services, opened the event by observing that the world is on the brink of another Industrial Revolution. He described the current "AI" revolution as being one of "augmented intelligence," not artificial intelligence. "It's going to change every aspect of our lives: at work, at home, the way with interact with others," he said, adding, "Vibrant communities need everyone to be in the game." It's easy to see a link between technology and education. Sonal Shah, executive director of the Breck Center for Social Impact at Georgetown University, noted that technology "gives us access to more information ... not just what's available in bricks and mortar libraries." Additionally, she said, teachers can use technology to create personalized learning strategies for students in large classrooms, which is already being done in some Chicago schools. Technology is also essential for the changing student population, said Shayne Spaulding, a principal research associate for the Urban Institute. Noting that more women, people of color and students over the age of 25 are now seeking secondary education than ever before, the needs of students themselves are changing. "Three-quarters [of students] are ‘nontraditional,'" she said. "This is the student body. How do we design programs for those students?" Technology isn't a replacement for human interaction, Spaulding added – "Students need a human element, too" – and noted that instructors themselves need support and education to best leverage the tools available to them. J. Puckett, senior partner and managing director of the Education Practice for Boston Consulting Group, said there is still a disconnect between high school students who say they plan to attain a college degree but then don't. Data as simple as the number of classes missed in a semester can be used to track these students' progress and predict their likelihood of finishing the degree. Access to technology is critical, especially for Generation Z (those aged 6-20) – and those to follow – who regard technology as an "appendage," Puckett said, adding that many K-12 schools readily already incorporate tech into teaching. "It's not one or the other," he said. But, he added, it's essential for everyone to have access to broadband Internet access and appropriate devices, so they can continue learning at home. "We have to invest in infrastructure," Spaulding said. People must pay attention to the connection between education and employment, Puckett said, noting that 40% of companies experience difficulty finding employees with desired skill sets. Technology can create data that show what jobs are hiring, and what skills are relevant, Puckett added, thus supporting both students and employers. Spaulding said Obama-era funding for community colleges allowed for building projects that provided appropriate physical space for learning, such as labs, which helps the education-to-job pipeline. She added that work-based learning and apprenticeships have good outcomes in hiring and income. Puckett and Spaulding discussed the rise of digital badges – online credentialing that identifies a specific area in which a person has acquired training. Spaulding said online badges are especially appropriate for youth to quantify skills they have learned outside school, such as in summer programs. "A degree from a university is an increasingly imperfect proxy, and not always inclusive economically," Puckett said. Caitlyn Brazill, executive vice president for development and communications for Per Scholas, which provides technology training for people underrepresented in tech fields, said ethnic diversity is essential to an equitable city, one in which every person can thrive. To that end, Per Scholas classrooms "teach skills to create lifelong learners through technology," she said. "Skills like problem-solving and critical thinking are essential to understand for the long term." Per Scholas has partnered with companies to offer classes on cybersecurity followed by apprenticeships, so students are ready for full-time work after they complete the program. "There's a motivation for employers to think about hiring creative people with tech skills," she said. The power of data to illuminate housing needs and issues cannot be overlooked, several speakers observed. Regina Nippert, executive director of the Budd Center at Southern Methodist University, which seeks to support children living in poverty, said "we need a multi-sector partnership to have a collective impact" on whatever problem might be the focus of discussion. Additionally, she said, "Data have to be in context ... or it's just noise." Nippert highlighted the National Neighborhood Indicators Partnership, housed at the Urban Institute, as an example of how data can be used to support neighborhoods and help residents define their own communities. The NNIP is a network of organizations that work collaboratively to support community improvement. When organizations work together, she said, it becomes easier to "identify what's here that works and how do we build on that. "Data are useful in context and in relationships, and useful for shared objectives," she added. 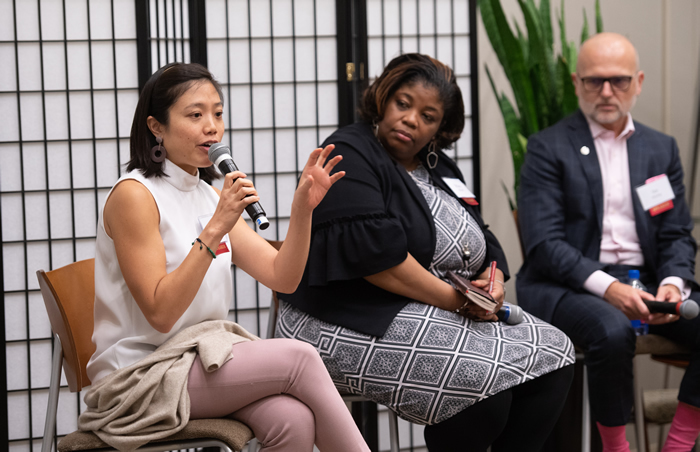 Tiffany Manuel, vice president for Knowledge, Impact and Strategy at Enterprise Community Partners, said data can help communities recognize the need for affordable housing and create spaces that are welcoming and practical. "We can share the vision of how we want a community to look through real-time data," she said. "We can use data and technology for engagement with conversations to discuss community benefits. We can look at data to see how many housing units were built, or how much money was deployed. We can ... compare that neighborhood with others around the country and look what happened in that community in five years." And housing necessarily relates to transportation, said Tim Fleming, director of Enterprise Sustainability for AT&T. Noting that by 2030, the majority of the U.S.'s population will be employed in urban areas, the need for efficient and available systems to move workers where they need to be is paramount. "Technology can help transit systems get people from point A to point B," he said. In the end, those at the symposium agreed that the "disruption" that is occurring creates opportunities as well as challenges. "We must help investors think of social and financial returns," Manuel said. "Are neighborhoods becoming stronger? Investors want financial and social returns. They want data which show their return on investment outcomes."